As a young man, Army veteran and athlete Randy Merrill followed his natural interests into training and coaching at some of the nation's top fitness chains. The Atlanta native became one of the top producers for American Fitness Centers (later bought out by Bally Total Fitness) and then helped expand Australian Body Works, now known as LA Fitness, from five to 12 locations in the Atlanta market. "Australian Body Works had a great product but no one strong in sales," Merrill says. "I remedied that, increasing the cash flow from $20,000 to $60,000 a month per store. By the time I left 18 months later, we had nine stores up and running in the Atlanta area." After a stint in the Los Angeles fitness scene, Merrill returned home at the age of 29 to live in his father's basement and reexamine his goals. "A fellow approached me about buying his tanning salon for very little money. My younger brother lent me $5,000 and that was the beginning. Within a short period, I had three Super Bodies Tanning stores in the Atlanta area," he says. By 1996, Merrill had joined forces with Alex Royter, whose strengths include daily operations. The result is Solar Dimensions, a chain of 14 upscale tanning salons in the Greater Atlanta area. While the salons were doing well enough, Merrill saw business fall for the first time, in 2008 during the economic downturn. "It's not really a growth business anymore," he says, adding that he takes pride in the fact that his businesses have always made money. Merrill says that in the tanning business there is a constant need to reinvent the wheel. "You have to look at what your competitors are doing and tailor your training on a regular basis. Basically, you have to do everything yourself that you can get with franchising," he says. He became a franchisee for the first time in 1995 with a Planet Smoothie location (later sold), and in 2010 took on a Cartridge World unit with a family member. Merrill says he was interested in finding a franchise that would allow him to grow at a faster pace. "After having seen my father, at the age of 57, lose his rental business, I had become rather conservative in terms of risk and growth. My father came from the Depression Era, so he was afraid to borrow money to invest in his business. By the time he lost the business, I'd been doing his books for years, and that resonated with me, so early on I tended to only grow as I could pay for things," he says. "On the other hand, my partner seemed to go too far the other way. He borrowed for everything. Now I see that there's a happy medium, and I'm not so risk-averse. I don't have to pay cash for everything." Fortunately, he adds, he's been able to both self-fund and borrow from local banks. As the tanning industry was affected by the economy (he takes issue with the 10 percent tax the new health care plan contains) and increasing health warnings about skin cancer, Merrill became fascinated by the massage industry, which was beginning to boom. "I liked the idea of using my skill set--helping people become healthier--and Atlanta was very under-served in this arena," he says. In 2007, while conducting due diligence on the leading massage franchises, he spent some time watching franchisee Tom Gustoff in action at the Massage Heights location in nearby Sandy Springs. "I was impressed by the infrastructure and the business model, which is membership-based. A lot of the companies were simply selling massages with no commitment on the part of the individual customer. I knew that wouldn't work." Massage Heights offers clients a luxury massage experience in a day spa setting for a reasonable monthly fee. "With 25 million more Americans each year getting a massage than a decade ago, the room for growth is limitless," Merrill says. By the time he went to a discovery day at Massage Heights in San Antonio, he felt he'd found the right fit. He joined the growing company, which has been franchising since 2004 and now has 70 locations open and 110 more signed. In addition to working with Gustoff at the Sandy Springs location, the partners' second area location is slated to open in the heart of the affluent Buckhead neighborhood this spring. Leases are being negotiated for the third and fourth Massage Heights, and Merrill has signed a contract for at least 15 units over the next five years. If that goes well, he might consider doing the same in other states. "I'm nearly 50 years old now, so I've got to go as fast as I reasonably can," he says. 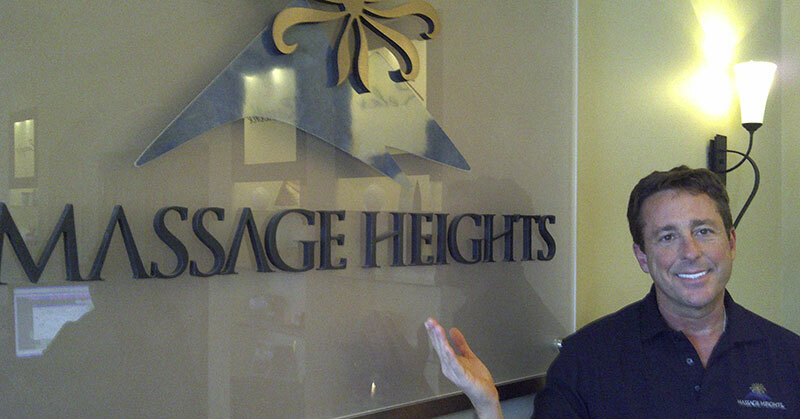 "I have more experience now, and I'm really excited about what Massage Heights is doing. Things are looking good." At the same time, he and his wife Mary, an executive with Coca-Cola, have a five-year-old son and a new baby due this spring. "We live near my son's school, and I'm more interested in walking him home from school than in spending all my time working. I've already got more than I ever thought I'd have as a young man, so my family is more of a driving force for me now. When I was young and gung-ho and worked all the time, I didn't really understand people with kids who didn't want to do that too. Now I get it, and it's made me a more compassionate employer," he says. Having learned a lot from his experiences as a business owner and multi-unit, multi-brand franchisee, Merrill suggests that young would-be franchisees go to work in the industry for a year before committing time and money to a unit. "At the end of that time, you'll make a wiser decision," he says. He also believes a strong mentor can prove invaluable to a new franchisee. "Tony de Leede, an Australian fellow who ended up selling Australian Body Works to LA Fitness for $27 million, served that role for me. I tried to be like Tony in business--but as a nicer guy," he jokes. "Now I'm reinvigorated by helping people with their health and working with a company that has great legs and is going to be growing for a lot of years." Building successful businesses while having plenty of quality family time. With a new store, it's 50 hours a week for 30 days. Then it's less, maybe 5 to 10 hours a week. I work out at least once a day. I ride the recumbent bike for one hour and I lift weights. It keeps the endorphins going and my mind fired up. Do you have a favorite quote/advice? Have a clear mind, an open heart, and willing hands. Be bold and courageous. When you look back at your life, you will regret the things you did not do rather than the ones you did. My father losing his business after many years. My first commitment is to family. A strong family makes for a successful professional life. It also makes me a kinder, gentler kind of manager and helps us grow as an organization. Be the best you can be, be a leader. Are you in the franchising, real estate, or customer service business? Why? Service, service, service--that's what it's all about. Coach up! Lead, follow, or get the hell out of the way. Greatest challenge: Being too intense. Not very, on a daily basis. I'm more in big picture mode. Hire on attitude and fire on accountability. Train and retain on accountability. In 4 years, I'd like to have 20 Massage Heights units. In 10 years, I'd like to be done. How has the most recent economic cycle affected you, your employees, your customers? Cartridge World has been strong, but tanning is down. Are you experiencing economic growth/recovery in your market? What did you change or do differently in this economy that you plan to continue doing? How do you forecast for your business in this economy? We're just driving for growth through service, service, service. By living below our means and through loans. Yes, things are looking better, though some banks still won't lend to startups. Yes, we've used our own money as well as money from banks. We have great managers and are building great P&Ls for a potential sale. Offering benefits and an awesome work environment. My goal is to always make more money and take care of it that way. If we stay focused on what we're doing and make money monthly, we can take care of these costs ourselves. How is social media affecting your business operations?